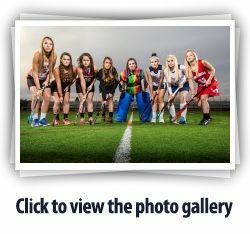 Announcing GameTimePA.com's YAIAA field hockey all-stars, headlined by Player of the Year Bryna Cook of Dallastown. Bryna Cook, Dallastown, sr.: A three-year starter and four-year letter winner, Cook played center forward as a senior after moving from the midfield. She was her team's leading scorer for two seasons and helped the Wildcats win three straight YAIAA Division I championships and back-to-back league tournament titles in 2012 and 2013. This season, Cook scored 19 goals and 12 assists through YAIAA tournament play. Cook's season highlights included tying Dallastown's single-game scoring record when she netted five goals against Dover. She also scored two winning goals in overtime this season. For her career, the University of Massachusetts commit has scored 39 goals — ranking sixth overall in Dallastown's 50-year history in the sport. The league's coaches voted her Division I co-Player of the Year. Haylee Anders, Dallastown, sr.: A three-year starting senior at sweeper and center back, Anders was the key defensive cog for Dallastown, coach Jeri Myers said. Myers used Anders to mark key players on the opposing teams on the way to the Wildcats' third straight YAIAA Division I title. Mackenzie Farley, Bermudian Springs, jr.: A junior center forward, she scored 35 goals and recorded 15 assists for the YAIAA Division III champion Eagles. Maggie Fees, Gettysburg, sr.: Team captain and center back, Fees scored 12 goals and had five assists to help the Warriors win the YAIAA Division II title and league tournament. The league's coaches named Fees their Division II Player of the Year. Fees has signed to play at West Chester next season. West Chester, ranked No. 1 in NCAA Division II at the time she signed her letter of intent, recruited just four players in Fees' recruiting class. Hannah Glover, South Western, sr.: The senior goalie capped a career with 500 career saves after being a four-year starter. "Incredible force in that cage," South Western coach Holly Long said. Glover played field hockey, basketball, softball and track in high school and is still considering her athletic options for college. Paige Harrold, Central York, sr.: A center midfielder and captain, Harrold scored 17 goals and added nine assists for the Panthers. She was Central's primary corner striker and defended on corners, as well. Harrold was voted a Division I co-Player of the Year by the league's coaches. She will play field hockey next year at East Stroudsburg and major in nursing. Maggie Noll, Dallastown, jr.: A center midfielder and two-year starter, Noll had eight goals and six assists this season for the Wildcats. Greta Plappert, Central York, jr.: A forward, Plappert generated 10 goals and 12 assists for the Panthers, who finished runner-up in the league tournament to Gettysburg. Paige Taylor, Red Lion, sr.: A senior captain, Taylor scored 13 goals and had four assists. She will play field hockey next year at York College. Coach Carol Gillmen said Taylor's speed and stick work from the wing helped set up scoring opportunities for the Lions. Sydney Tomassini, Gettysburg, sr.: She led the Warriors in scoring, setting the school's single-season scoring record with 25 goals. The previous record was 20. She also added five assists. The left wing continued to play through a quadriceps injury late in the season during Gettysburg's run to the YAIAA tournament championship. Alexis Young, Central York, sr.: She split time between forward and midfield, collecting nine goals and six assists. She also was a captain and will play field hockey next year at Stevenson University while majoring in early childhood education. Janelle Ebaugh, Gettysburg: Ebaugh guided the Warriors to the YAIAA tournament title in their first year as a league member and Ebaugh's 10th year as head coach at Gettysburg. The Warriors knocked off two-time defending league champion Dallastown in the YAIAA tournament semifinals, helping create a tournament championship game devoid of Red Lion or Dallastown for the first time in the tournament's five-year history. About 14 hours after Gettysburg's players had returned home from their semifinal victory, they took the field and defeated Central York, 4-2, to become the first team other than the Lions and Wildcats to win the league title. Gettysburg went 10-0 to win the YAIAA Division II regular-season title, and it went 18-0 against YAIAA competition. The Warriors advanced to district play, finishing the season 19-2. They scored 114 goals and allowed just 10. Bermudian Springs: Lindsey Brehm, Sarah Crane, Nicole Wolf. Biglerville: Maddie Wenk, Sierra Frock. Central York: Sara Rilatt, Jordan Hershberger. Dallastown: Lydia Trout, Jenna Abrahamsen, Karley Andrews. Fairfield: Lydia Westry. Gettysburg: Emma Bahm, Katelyn Gormley, Megan Miller. Eastern York: Tia Judy. Hanover: Morgan Herrick. Kennard-Dale: Jordan Miller, Emmie Dressel. Littlestown: Alexis Morey. New Oxford: Kaelyn Long. Northeastern: Kirstin Josey, Ashley Meyer. Red Lion: Jayla Godfrey, Kynslee Shepherd, Jackie Golden. South Western: Montana Utz. Susquehannock: Camryn Burke, Kristy Langhan. West York: Alyssa Howard, Madison Miller. York Suburban: Tagan Lehr.